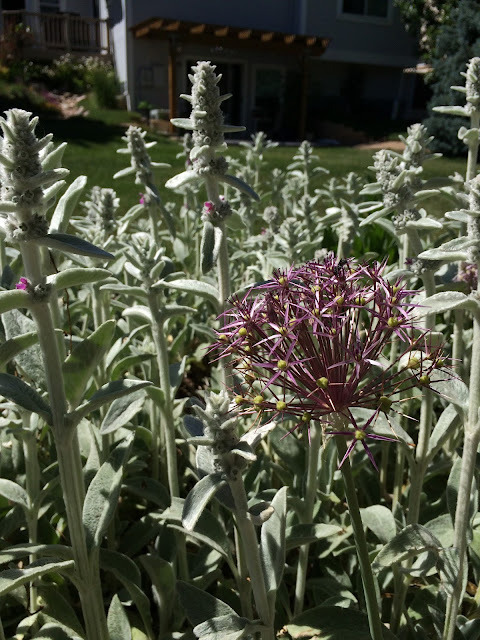 If your question is, "What bee plant does well in Colorado that I can't kill?" the answer is Lamb's Ears. So prolific it's invasive, but how can one say, "No," to a plant so loved by bees? And not just honeybees but also bumble bees, mason bees, and butterflies as well. Speaking of invasive, the wool carder bee favors this plant for its white hairs, or wool, which it gathers with its mandibles to create chamber partitions in its nest. If you can't see the video below, click on over to my Instagram page and you'll see the bee gathering a big wad of fibers. Stachys byzantina is so easy to grow, you don't even really need to "plant" it. Many a patch in my garden started as clumps ruthlessly ripped out and forgotten, left to die but instead rooted. Once established, it needs no supplemental water. It takes mile high sun and heat without wilting, and blooms profusely through the summer with a candy sweet perfume that just beckons pollinators to partake of its sweet nectar. Not only does this ground cover spread by stem rooting, it is a ready reseeder. The flower spikes stand 2-3' tall above the furry foliage and when the monsoonal rains come they flop over, I think as a strategy for seed dispersal. As highly visited by bees as the flowers are, seeds are abundant. To help keep this rampant grower in check, deadhead by grabbing the flower stalk down low and yank hard, letting it pull whatever it may with it, usually a decent length of rooted stem. As a preventive measure, I even remove flower stalks as they develop, as many as I can reach from the front edge of the garden without stepping onto the mulch. This creates a nice low border of just the foliage. Like a crème brûlée, this pairing is about contrasts and complements: furry, vertical Lamb's Ears and sharp orbs of Star of Persia. Its in-your-face metallic purple is echoed in the magenta pink of the inconspicuous Lamb's Ear blooms, while tiny orbs of green in the ripening onion blossoms complete the final balancing act. 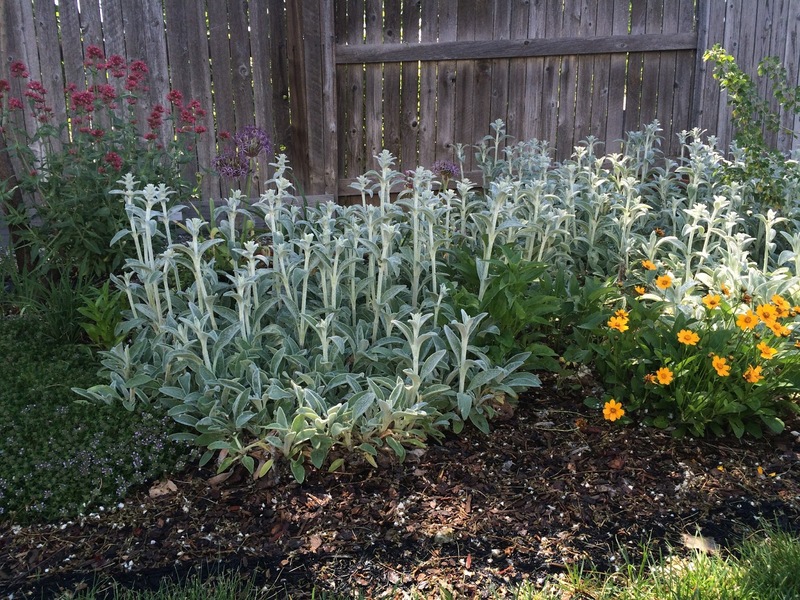 Early June: Reiter's Thyme (just starting to bloom), Jupiter's Beard, and Mouse Ears Coreopsis flank the Lamb's Ears in this no-water bed. More Lamb's Ears greets me when I go out the front door. The other plants are sedum (unknown var. 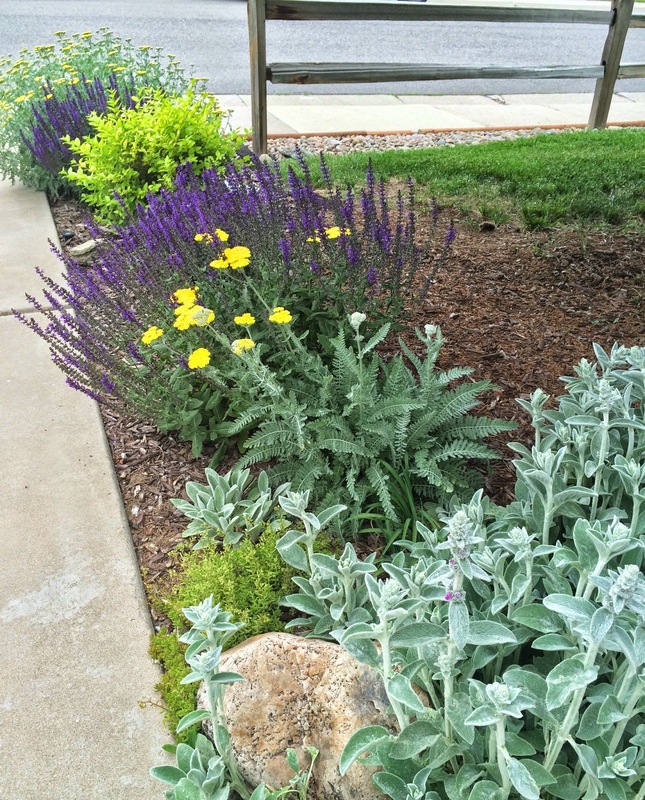 by the rock), 'Coronation Gold' yarrow, "Mainacht" salvia, golden privet, more salvia and yarrow. This highly xeric garden is as much about the foliage as it is about the flowers. Seedlings are just as furry as the parent plants and once identifiable, transplant easily. Pretty handy if you've got bare patches in your garden where nothing else will grow. Keep in mind, though, that lamb's ears are not evergreen and our harsh winters turn the leaves a drab brittle beige, creating quite a spring cleaning task if you've got huge swaths of the stuff. It rakes up pretty easily and smells sweet like the flowers. Be watchful for ladybugs when throwing the leaves into the trash or compost pile. Love, love, love the lamb's ears! My neighbor has some out by the road, and the pink flowers are always so cheery. Looking for plants to put around my hives. Based on your description, I think this will be a must!